Walthamstow: Hands off our public amenities: 'We aren't going away'. That was the mood of the public meeting of around 60 people organised by the Save Our Square campaign on 26 January. London Mayor Sadiq Khan's decision to grant permission to redevelop Walthamstow town square in east London was met with anger and feelings of gross betrayal, writes Linda Taaffe, Waltham Forest Socialist Party. Homes for All - Not billionaire profit! 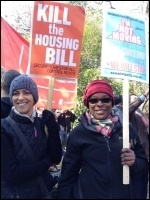 Socialist Party activists and local residents attended a meeting on 3 March organised by the Trade Unionist and Socialist Coalition (TUSC) in Walthamstow. Save Our Square occupation: "This land is our land!" What we saw including an appalling Tory attack on the homeless, an NHS tale, refugee solidarity and a train robbery. Letters to the Socialist's editors. Liverpool FC and the fight against racism; Guardian's hypocrisy over Corbyn. When we organise and fight back, we can win. That's the lesson of the Butterfields Won't Budge campaign. Butterfields campaign: 'We're not for sale'! Reports from Stoke, east London, Ramsgate and Burston.